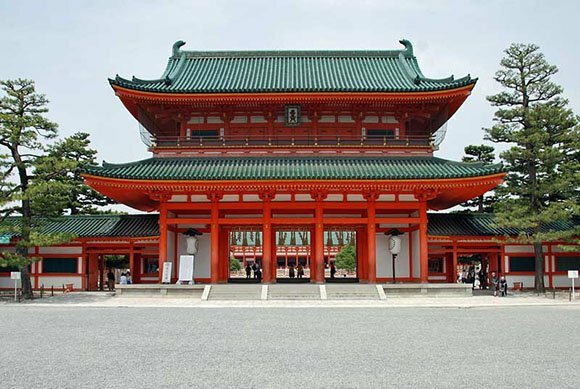 The Heian Shrine was constructed in 1895 to celebrate the 1100th anniversary of Kyoto being the Japanese capital (since Heian was the original name of Kyoto). The shrine is dedicated to the spirits of both the first and the last emperor who reigned the country from this city, and a huge torii gate marks its approach. The grounds around the shrine are spacious, with the buildings being a part replica of the Imperial Palace from the original Heian Period, albeit on a smaller scale. Visitors can explore the attractive garden of this popular tourist spot for an entrance fee, and discover its varied plants, traditional buildings and ponds, however its most stunning feature has to be its many cherry trees. As these weeping trees bloom slightly later than the city’s other cherry trees, this garden is a top spot for blossom fans during the end of the season in April. There are often special events held in the courtyard of the shrine too, including the Jidai Festival during October. As part of this occasion, the foundation of Kyoto is celebrated with a parade during which participants wear Japanese historical costumes and progress to the shrine from the Kyoto Imperial Palace. Copyright © Kyoto-Tower.co.jp - We are in no way associated with the Kyoto Tower, Kyoto Tower Hotel or the Kyoto Station. We only try providing useful information to tourists traveling to these destinations.